No TV coverage, little fanfare, no result. A shame, Scottish cricket could have done with a bit of publicity. Gavin Hamilton made 60, which isn’t bad for a man with a Test average of zero. 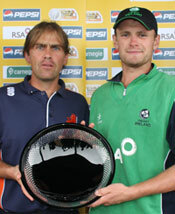 Ireland, the Netherlands and (pending confirmation of Zimbabwe’s non-participation) Scotland have all qualified for next year’s World Twenty20, although the final of the qualifying tournament was rained off, so Ireland and the Netherlands had to share the trophy. So, who will Herschelle Gibbs be hitting for 36 in an over this time next year? Ireland will obviously be hoping that the World Twenty20 will be an opportunity to replicate their heroics in last year’s Word Cup. Their success in qualifying was partially due to the astute bowling of Andre Botha, who took 8 -42 in the tournament as a whole, and also finished with the highest batting average of any ‘Irish’ player in the tournament. The Netherlands’ star man is Ryan ten Doeschate, who continued his good Twenty20 form, and wasMan of the Match in the Semi-Final. Another Dutch success story was Peter Borren, who made a fair few runs as well as taking 5-76. Scotland’s Dewald Nel took 9-60 across all matches, with an economy rate of 4.00, quite an achievement for a twenty20 bowler. Kyle Coetzer and Ryan Watson were the pick of the batsmen for the Scots, making 199 runs between them, with Watson’s highest score 54 and Coetzer making 48 not out.